Yes way! very happy to say that I’ve managed to brew two weekends in a row! This weekend sees us brewing up a nice blond ale (the missus likes it very much). 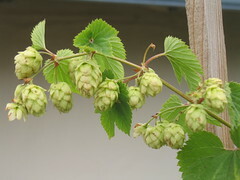 I’m going to use the rest of my cascade hops that I grew this year at the finish just to give it a nice nose. Good times! Happy Labor Day! Finally brewed this weekend, CRIPES! So its been something like 3 months since I’ve had an opportunity to fire up the ghetto brew rig and get it done! 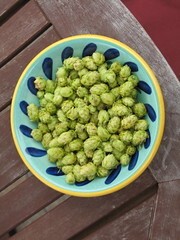 I messed about with a Arctic Red clone recipe a bit and was even able to use 1/2 an ounce of the 1.5 ounces of Cascade hops that came from my hop garden! Its bubbling away in the fermenter this morning and I’m managing to keep it around 68 degrees. Just a short 3 weeks to go before the kegerator get’s fed again! You are currently browsing the Half Moon Brewer – Hombrew on the Coastside weblog archives for August, 2008.